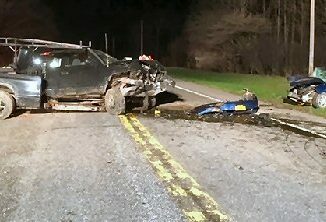 High school students from eight Oswego County school districts had to use their creativity as they were transported back in time as part of a recent academic competition that focused on events, trends and songs of the 1970s. 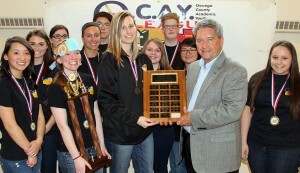 Mexico High School students are all smiles after being crowned OCAY League champions. Team coach Shannon Bigelow and OCAY League Coordinator Dante Ascenzi display the trophy along with team members Breana DeLong, Alyssa Facteau, Jacob Frasier, Hunter Gowans, Sarah Hubbell, Kennedy Lamb, Corrinne Perrotti, Robert Pritchard, Andrea Ross and Hannah Sheldon. 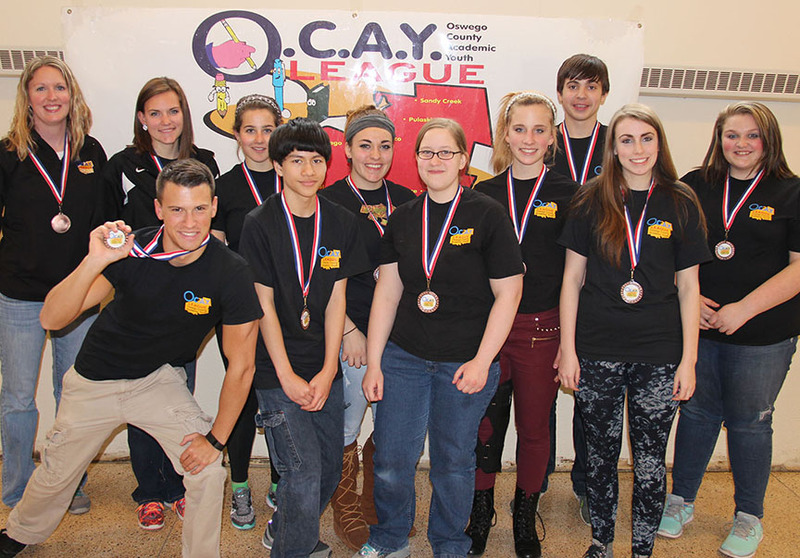 The event was the fourth and final Oswego County Academic Youth League competition of the school year. Organized in the spring of 1997, the league was founded on the belief that academics merit a standing comparable to athletics. Students’ academic skills are challenged and showcased in a wide variety of competitive events that emphasize scholastic excellence, team building, leadership, and creativity. A particular strength of the league is its emphasis on cooperative problem solving. Members of the Oswego High School OCAY League team display the second place medals they earned. In the back row, from left, are Matt Spaulding, Kyle Osmun, Chris VanGorder, Ayla Busch, Olivia Flint and coach Kayley Morse. In the front, from left, are Roman Madlangbayan, Lainey Celeste, Clare Donovan, Ana Alcasid and Jenna Ballard. To align with the purpose of the league and to challenge the students to think critically and creatively, teams had to complete three tasks related to the 1970s. The decade was incorporated into each mission, as students created original songs based on the instrumentals of a popular song from the ‘70s; they designed a T-shirt and accessories to reflect fashion of that era; and they took quizzes about politics, sports, and entertainment during that time period. After tallying the scores for each task, OCAY League coordinator Dante Ascenzi congratulated the students for their efforts and creativity. 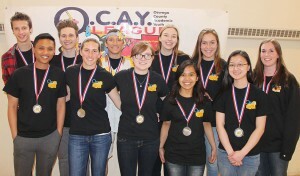 The OCAY League team from Sandy Creek poses for a group shot after earning the bronze medal in a recent competition. In the back row, from left, are coach Caitlin White, Autumn Darling, Maggie King, Taylor Mullin, Rachel Yerdon, Collin Reff and Mariah Hess. In the front row, from left, are Jay Ivison, Nicky Radford, Anita Glenister and Sarah McDougal. 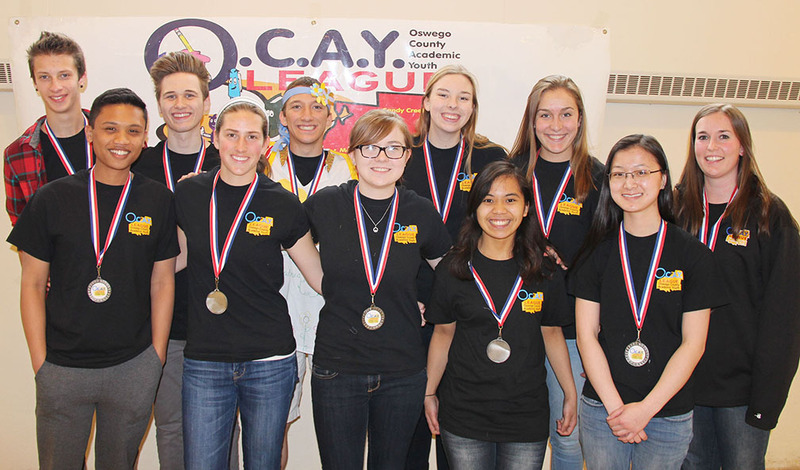 The hard work paid off for the Mexico team members, who took home first-place medals for the competition and also earned a trophy as the 2014-15 OCAY League overall champions. 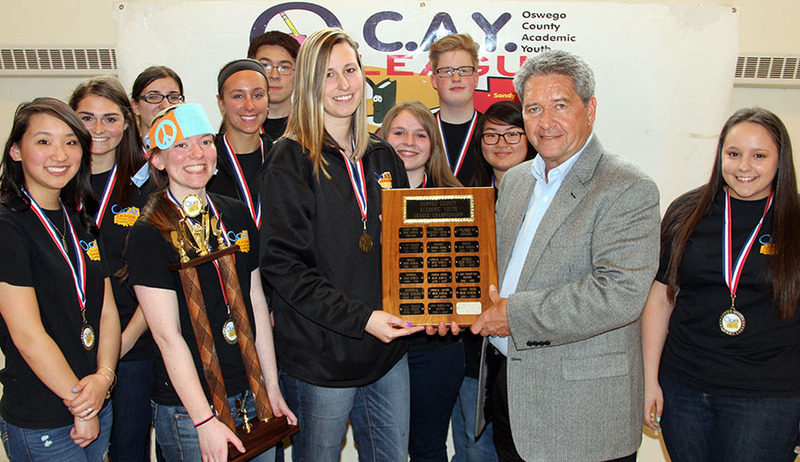 The team from Oswego finished in second place for the ‘70s competition, while the Sandy Creek team earned the bronze medal. Additional recognition plaques were given to out-going coaches Sue Ryan (Fulton) and Liz Sorbello (Central Square) honoring them for their years of service to the league. OCAY League is coordinated through the Center for Instruction, Technology and Innovation’s gifted and talented program.